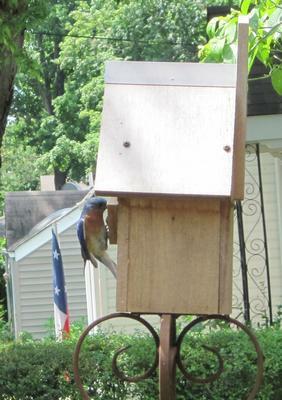 Second Year for our bluebird nestbox. We had two broods with same parents in 2007. 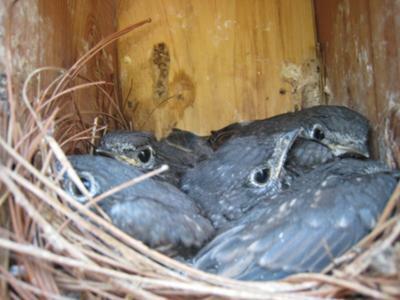 I am attaching photo of 5 baby blues a couple days before fledging. We enjoy the entire process of watching the female parent build her nest with her mate "supervising", seeing how many eggs are laid, checking the nestbox each day after baby blues have hatched and watching the parents feed and take care of their brood. We named our adult pair Django (male named after a jazz guitarist) and Emily (female named for a female jazz guitarist). Django and Emily are great parents and are very good at keeping other birds, squirrels and cats away from their family! Enjoy the photo. They Have Moved In ! 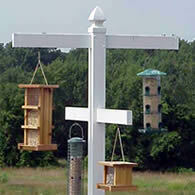 I built two crude BB Boxes and placed them in upper field near our home. 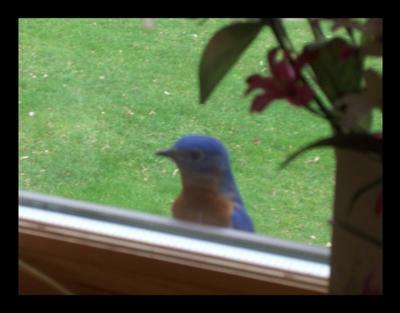 After a week or two we had a male blue bird continuously at windows on East side or our house (Picture). I noticed that they were checking out the houses that I had set only about 30 feet apart. Then one or more was continuously on my pickup truck. A friend told me to separate the houses. I did this and believe there may be a family in each. One morning I took about 80 shots of them (all 4) on wires trees and both vehicles in our drive way. They sure make a mess of them. I have many more photos of them. I decided to sprinkle some cereal on the ground to see what I could attract and since it had dried apples and nuts in it I saw a pair of bluebirds again that I hadn't seen in a few years. They're so beautiful!! Then came the snow. It was just perfect timing for photo ops. I had been watching everyday since the eggs were laid. After hatching also did a daily check on the babies. I knew they were getting ready to fly when I checked one morning and by afternoon only this one "little guy" was left. As they say, "he looks put out" that he has been left all alone. 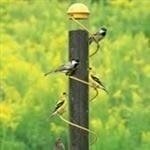 For years I tried to attract purple martins. I've had four different styles of martin houses which, over the years, were relocated to different locations on my property. Martins came, checked out the housing, even went inside and poked their heads out to have a look-around. But none took up residence. Guess they wanted A/C and Satellite. 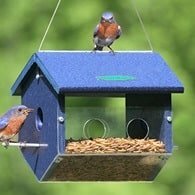 Bluebirds aren't so picky. 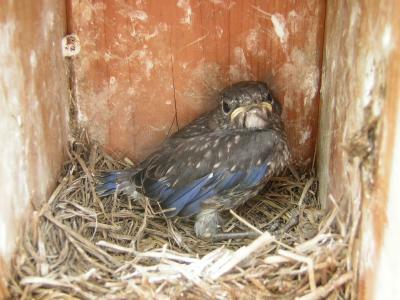 I gave up on martins about ten years ago and Eastern Bluebirds made good use of the tall, vacant houses. 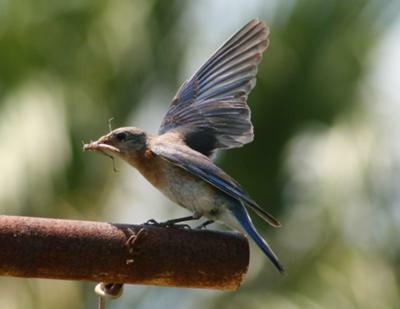 I once had three bluebird boxes mounted on fence posts, but snakes and fireants made rearing young impossible. 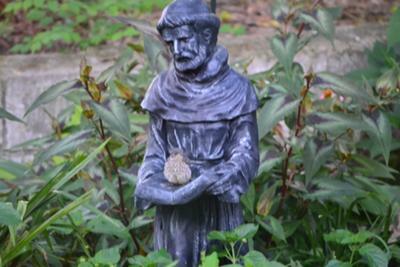 Recently I relocated the backyard birdbath for photographic convenience. During those often long waits for a photo-op, I like sitting in the shade on the back porch. The day after the relocation, I took my position behind the tripod and prepared for a long sit. 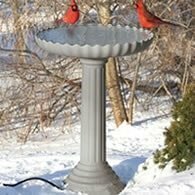 Just minutes later, a bunch of small birds came to the birdbath. 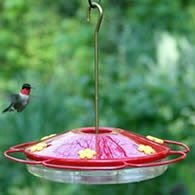 My first thought was, 'I've never seen birds like these before' and I couldn't identify them. 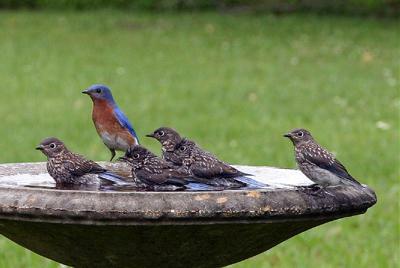 Then poppa bluebird showed up to supervise the kids' bath, and I knew. Can you imagine how hard the parents worked catching enough insects to feed these five young ones? I take birds pictures all year long since I live in Florida and the weather is great. 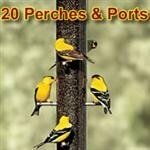 I can't wait for our winters since we get a lot of northern birds. 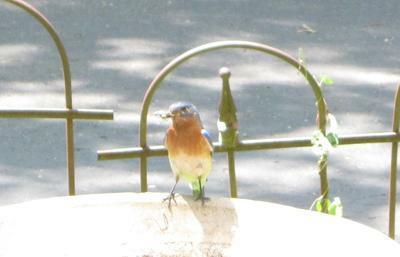 I noticed that I had taken a lot of pictures of different birds but I never had taken a Bluebird picture. 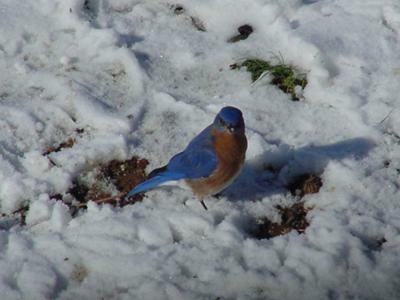 Since I live in the country I started looking for Bluebirds, about to give up, my neighbor told me she had Bluebirds at her house and invited me over to take some pictures. I brought my chair since I knew I would be there all day. I picked out a spot, got comfortable and waited, and waited...Finally, about an hour went by and here comes the first of many Bluebirds. I captured many nice shots. 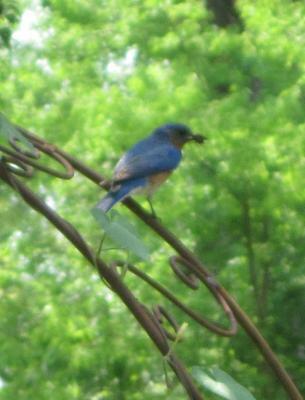 The Bluebirds were feeding their babies so I was careful not to scare them. As the title suggest, this was our second nesting this spring, the female is now setting on her third nest this year. There were two babies in this nesting who hatched and flew from the nest. We watched for several days and could see the babies were getting braver by the day and started watching with the camera and were able to catch one as it finally got it's wings and left the nest. It stayed around in the flowers for a time and we were concerned that it would be a tasty treat for a neighborhood silvester but am happy to report that did not happen. dismay, the male is no longer with her which makes us wonder what has happened to him. 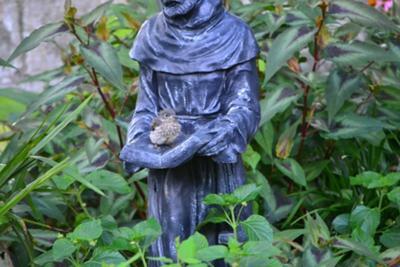 This seems to be a very comfortable site for the bluebirds, their nesting that we captured on film this past year had a total of five babies who hatched! 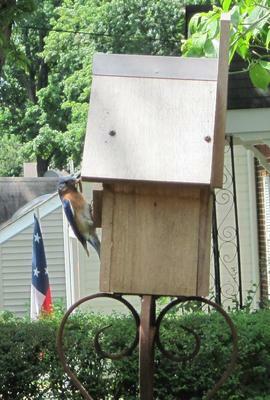 One year my friends gave me a bluebird house as a thank you gift for watching their dog over the Christmas break. It was a lovely house and it took me several years to get around to buying a post and putting it in the yard. 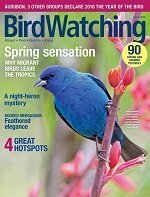 I had never seen a bluebird in my yard and thought I was wasting my time, but I was pleasantly surprised when I noticed a pair of bluebirds coming in and out of the house with material for a nest. By the end of May it was obvious that there were babies inside. I could hear them but was afraid to get to close and upset the parents. They worked sun up to sun down as a team, carrying a steady stream of food into the house. 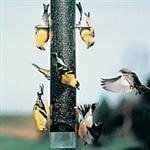 I would sit on my porch and watch them each afternoon. When school was out in June, I spend even more time watching them. 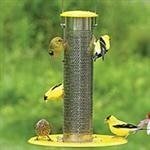 Until one day they were making a lot of noise, but no longer carrying in food. Then I got to watch four small birds come out of the house and take their first flight. It was an awesome experience.